You’re going to want to clear a bit of time in your schedule for October. That’s when The Best American Science Fiction and Fantasy 2016 collection arrives, and io9 is proud to debut the full list of stories chosen as the year’s best—including one from io9 co-founder Charlie Jane Anders! This list actually also serves as the Table of Contents for the book, which is helmed by guest editor Karen Joy Fowler (author of We Are All Completely Beside Ourselves, among other novels) and series editor John Joseph Adams (editor/publisher of Lightspeed Magazine and much more). Adams was even kind enough to give us a description for every story in the collection, included below. Imagine a city open to all languages, all migrants, all misfits. A city with only one problem: It’s lost forever. This story begins “The vampires were conjugating in the courtyard,” yet the direct inspirations for it are the Culture novels of Iain M. Banks and Cordwainer Smith’s “The Game of Rat and Dragon”; inside that seemingly incongruent combination lies the kind of strange and wonderful—and yes, science fiction—story that only Kelly Link could write. An elegiac contemporary story of a woman confronting her own mortality, who feels like a ghost as a result of her cancer diagnosis...and perhaps is one. A gorgeously-written tale of interplanetary wars, psychic space lions, identity, and loss that gloriously unfolds as things go wrong on an alien planet. A compendium of tiny stories about the strange creatures that hide under your bed and inside your cupboards, and don’t seem to mind that you’re single. A cancer patient gets new synthetic eyes, but after the surgery has trouble finding himself in the mirror. A restless wife finds her life stolen by a shape-shifting, love- starved fungus, but her faithful dog won’t be fooled. The three struggle for control of a crumbling house, a clueless husband, and a once-despised domesticity. So-called “experts” might consider the surgical procedure you’ve been invited to undergo to be . . . unwise. You’ll do it anyway. Don’t worry about those so-called “side effects”; that’s totally normal. This story delves into eternity, madness, and love by revisiting the Mad Tea Party from Alice’s Adventures in Wonderland. A near-future story of crowdsourced warfare and viral kill videos that imagines how war might look if we weren’t allowed to look away. A lyrically written tale of romance between Dunia, a jinn disguised as a young woman, and a philosopher named Ibn Rushd, set in 12th century Spain. The people are beautiful, the parties are lavish, and true love is always a glance away. In Claire’s world, romance is a game played every night—but the rules are strict, and the stakes are not always what they seem. A small group of soldiers is sent to a remote jungle as a punishment for magically reversing the attributes of mercy for the purpose of torture. Surrounded by a forest full of strange noises, years of rain, and no communication from the outside world, they decide to take action. This story depicts a Balkanized USA in which gas is scarce and daring oil bandits fight for the future of America’s highways. There’s magic in the old well at the edge of the wood, and anyone buy a little for just a penny. But that’s the thing about magic: You get what you pay for. This story was written before Pokémon Go started taking over people’s brains, but it’s a timely commentary on how digital critters can take on a life of their own. In the story, a new game becomes popular among people who are suffering from a mysterious new neurological disease, and it turns out that sometimes games are the best way to express the most important things. Re-imagines the Stonewall Uprising to tell a story of divas dying, brutal police, and the broader societal hate they transform into violence, and the (supernatural) power that people have when they stand up and fight back together. Anyahera, Thienne, and Shinobu have one marriage and one mission. The mission is to destroy any transhuman civilization that might threaten Earth. And the mission must come before the marriage. What are the possibilities inherent in impossible machines— those that do not and cannot exist? An engineer in Mongolia, a mathematician in Italy, and an anthropologist in Mali entangle with such devices through space, time, and history. A parrot muses about the search for extraterrestrial intelligence. If that’s not enough for you, you can see a giant list of the stories that didn’t quite make it into the collection here. 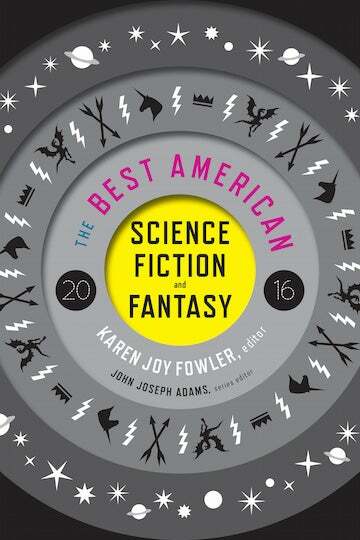 It will give you plenty to read until The Best American Science Fiction and Fantasy 2016 becomes available on October 4.